Posted May 28th, 2018 by admin. Following April’s Oral Health Month is May’s Dental Care Month. Dental care is mostly done at home, and supported by regular checkups and visits to your dental hygienist. We all know to brush twice a day, but studies have shown that over 50% of people do not clean between their teeth as often as they are supposed to! Brushing cleans the fronts and backs of the teeth, but with brushing alone, only 2/3 of the tooth surfaces are being cleaned. That is a whole third of the tooth that is being missed! After all of the articles came out in 2016 about the lack of evidence for flossing, we have gotten many questions about whether it needs to be done, and what kind of alternatives there are for flossing. While there are no studies that have isolated flossing as a factor preventing cavities, we do know anecdotally that there is a huge benefit to your gum health by cleaning between the teeth. Even the man who did the original search into whether or not there was research to support flossing said that he wouldn’t stop flossing! There was a great analogy presented around that time: we do not have clear research that supports using a parachute while skydiving, but would it stop you from using one? Or would you like to be a part of the study that is done to prove whether or not it is needed? It is the same idea with flossing. It is unethical for studies to be done that prevent people from flossing when we already have the knowledge that it is beneficial. Flossing is not for everyone. There are many different factors that can affect your ability to floss, such as your manual dexterity level, the spaces between your teeth, how much recession or bone loss that you have, etc. The good news about this is that there are many alternatives out there for you, to clean between your teeth. The first alternative is a water flosser. 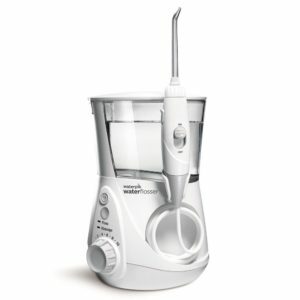 The most common water flosser is a waterpik. Water flossers use the hydraulic forces of pulsing water to push debris out from around and between the teeth. 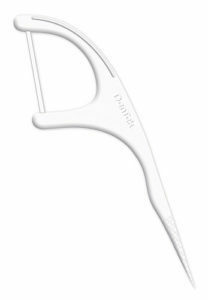 They are very effective for people in orthodontic appliances or for people who are adverse to string floss. The second alternatives are interdental brushes. 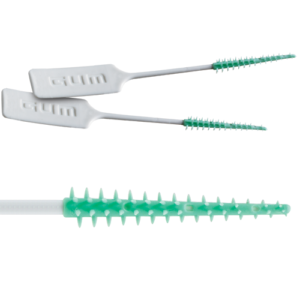 These brushes are used between the teeth and use 360° bristles to sweep debris and plaque out from between the teeth. These brushes come in various different sizes to accommodate different sized spaces between the teeth. These are great for people with bigger spaces between their teeth, around implants or orthodontic appliances, and for areas with bone loss and recession. Thirdly, an alternative is softpicks. These are like toothpicks, but unlike their wooden cousins that have the potential to fracture between the teeth or to leave slivers, softpicks are created out of plastic and synthetic rubber which prevents damage to the gums and are flexible to fit easier into hard-to-reach areas. Lastly, there are devices that make flossing with traditional floss easier. 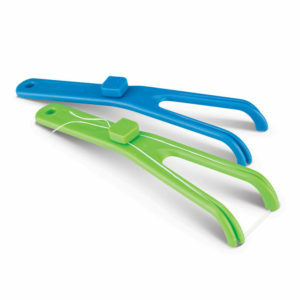 There are floss sticks, which feature a floss head and can be used one-handed. These are great for on-the-go, for people with dexterity issues and for kids. Additionally, floss holders are reuseable devices that hold the floss and can help greatly for kids and people with dexterity issues. It should be noted that floss is still the gold standard, meaning that it is still the recommended way to clean between the teeth. We do, however, recognize that not everyone is suited for just floss. If you have any questions about alternatives for cleaning between your teeth and if any of these alternatives are suited for you, ask your dental hygienist at your next check-up.